The Art of H.P. 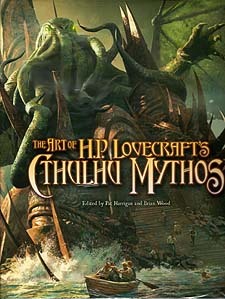 Lovecraft's Cthulhu Mythos is a journey into the dark and haunting images inspired by the books and stories of the Cthulhu Mythos. H.P. Lovecraft's stories have fueled the imaginations of hundreds of authors and countless readers, with their suggestions of ancient and terrible beings beside which humankind is insignificant, and the horrible truths that our minds are not meant to know. Now, for the first time, the art inspired by these classic tales of horror is collected in one lavish volume, featuring paintings and drawings by some of today's most talented artists, including Michael Komarck, Torstein Nordstrand, Paul Carrick, Anders Finer, and dozens of others.